Lingerie and swimwear manufacturers like LACE Lingerie have a little secret, and once you understand it, it can make shopping for bras easier! Your bra size is made up of both a number and a letter. The number indicates your band size, which is the part of the bra that goes around your ribcage. It refers to either centimetres (for example, 70, 75, 80) or inches (32, 34, 36). The letter portion of the bra size indicates your cup size, which is the volume of your breast. Together, both the number and letter make up the size of the bra. One doesn't mean anything without the other. To further complicate things, the letter (the volume of your cup) is dependent on your band size. So, not all E cups are the same. If we compare different band sizes of E cups on the Perle bra from PrimaDonna, from a 65 band to a 85 band, we can see that the cup gets bigger with each band size. Not all cup sizes with the same letter are the same volume. PrimaDonna Perle bra: Not all E cups are the same. 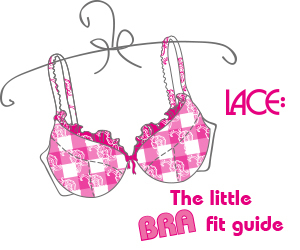 Let's look at the relationship between bras for sister sizing – or 'cross-grading' as it is called in the industry. These bras are all completely different sizes, but are sister sizes and they are related. The relationship is that the volume of the cups is the same between the different band sizes. We know that from the previous example, every time the band size got larger, the cup size did as well. Sister Sizing will show us how we can change the band size, but keep the cup size the same volume. Here's an example: an EU 75E is one bra size, and has sister sizes of 70F and 80D. These bras have both different band sizes and cup sizes, but the volume of the cup is the same. This means that if you are happy with the fit of the cup of a 75E, but not the band, perhaps it's too loose, or too tight, you can adjust to a sister size for an alternate fit. PrimaDonna Perle - four sister sizes with identical volume, from 65G to 80D (30G to 36D). During bra fittings in LACE shops or via Skype/Facetime, some women are surprised how much their size changes. Most of the time this is because of sister sizing. For example, someone may be wearing an EU 75F and need a tighter band, because the bra is riding up her back, and one cup size larger, so we will try a 70H. The 70G is the sister size, and then the cup volume needs to be increased from the G to the H.
The coloured chart below shows the equivalencies in the European cup sizes. Remember, for UK bra sizes, you'll need to factor in the double-letter sizes of DD, FF, GG, HH and JJ, refer to the second chart. Remember, for UK bra sizes, you'll need to factor in the double-letter sizes of DD, FF, GG, HH and JJ, refer to the second chart. So, what does cross-grading really do, why do manufacturers do it? This is the method that manufacturers use to prepare all of the patterns for the bras. LACE carries PrimaDonna Deauville in 38 different sizes, but Deauville is made in 68 different sizes. Rather than developing a pattern 68 times, only a few sizes will be developed and fitted, with the rest of the sizes produced from the initial patterns. There will be differences between some of the patterns, as you cannot go straight from the smallest size to the largest size when you have such a large range of sizes. This may be where you find that in some sizes there may be more or less coverage in the sister size, or straps positioned slightly different, like between a 75I and 80H. It can be very difficult to offer so many sizes and make the patterns in so many sizes, so by cross-grading the patterns, the process of creating all of the different sized patterns is made simpler. As well, the actual underwires in the bras of sister sizes are identical. A company does not need to develop a different underwire for every size, but with the cup volumes being the same in sister sizes, the same wire can be used. When you are finding your bra size, or trying a new brand, it's helpful to understand 'sister sizes' to find your best fit (see our Little Bra Fit Guide).